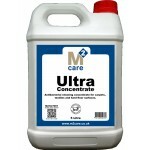 Antibacterial cleaning concentrate for carpets, textiles and hard floor surfaces. 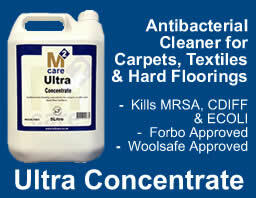 Tested to meet the following standards: BS EN1327 (MRSA), BS EN 13704 (CDIFF) and BS EN 1276 (ECOLI). 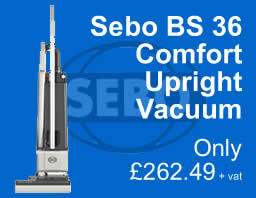 For the quick and effective removal of soiling and santising of all carpets, textiles and hard surfaces. Carpets, fabrics and other sensitive surfaces must be pre-tested for colourfastness, texture change and suitability before proceeding. 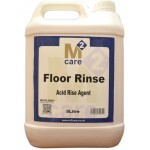 Carpets and fabrics must be rinsed with a suitable fibre and fabric rinse. 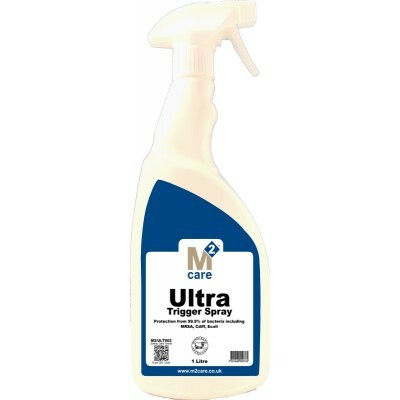 The specialist formulation enables Ultra Concenrate to cope with many varied cleaning tasks on carpet, fabric, walls, floors, paintwork, sinks, kitchen equipment, stainless steel and aluminium. Ultra can be applied using rotary machines, scrubber driers, hand spray and mopping equipment. Approved by Forbo Flooring for use on Marmoleum flooring. M2 Care Daily is a combination of high powered cleaning agen..
M2 Gloss 5L - Emulsion Floor Seal Gloss Floor treatment i..
M2 Guard 5L - Emulsion Floor Seal Guard is a floor seal w..
M2 Enhance 5L - Cleans Untreated Stone Floors Enhance is ..
M2 Floor Rinse 5L - Acid Rinse Agent An acidic rinse for ..
M2 Foundation Emulsion Floor Seal 5L An emulsion floor se..